THE Dubai police department is making sci-fi a reality with the introduction of hoverbikes for its officers. 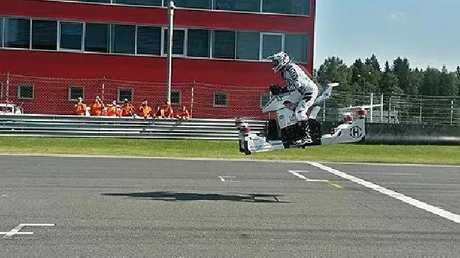 Unveiled at the Gitex Technology Week conference, the Star Wars-esque Hoversurf Scorpion has been designed to help police avoid congested traffic in emergency situations. And Dubai police are going to start using them for patrols. "The bike can fly without a passenger and can go up to six kilometres," First Sergeant Ali Ahmad Mohammad told Gulf News. "It can fly for 25 minutes and can carry up to 300kg of weight at a speed of 70km/h." This isn't the first sci-fi inspired tool for emergency services, with the Dubai fire department's use of "jet packs" to fight fires. Hoversurf chief executive Alexander Atamanov said his company had signed a memorandum of understanding to mass produce the craft in the Dubai area for local police. Director of the smart services department at Dubai police, Brigadier Khalid Nasser Al Razooqi, said the force was introducing a smart electric motorbike with multiple cameras to capture reckless drivers and small driverless robotic vehicles equipped with biometric software. "[The driverless robotic vehicles] can recognise people in any area and identify suspicious objects and can track suspects," he said. "It will be deployed at tourist destinations in Dubai. It has cameras and will be linked to the command room."